Uppsala University is a research university in Uppsala, Sweden, and is the oldest university in Sweden, founded in 1477. It ranks among the best universities in Northern Europe in international rankings. The university rose to pronounced significance during the rise of Sweden as a great power at the end of the 16th century and was then given a relative financial stability with the large donation of King Gustavus Adolphus in the early 17th century. 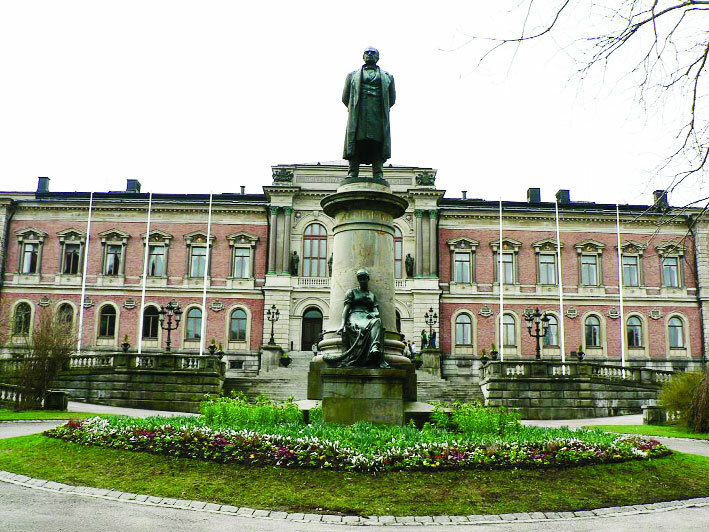 Uppsala also has an important historical place in Swedish national culture, identity and for the Swedish establishment: in historiography, literature, politics, and music. Many aspects of Swedish academic culture in general, such as the white student cap, originated in Uppsala. It shares some peculiarities, such as the student nation system, with Lund University and the University of Helsinki. The governing board of the university is the consistory, with representatives of the faculties as well as members representing the students and non-academic employees (3 professors and 3 students), and ten university outsiders appointed by the Swedish government. All these members in the consistory have the right to vote. The unions active at the university also have three representatives in the consistory; these members have the right to speak but not any right to vote. Since the last reorganization in 1999 the university has a separate body called the academic senate, which is a wider, but mostly advisory group representing teaching staff / researchers and students. The executive head of the university is the rector magnificus (that also have the title “vice-chancellor”), whose deputy is the protector. In addition, there are three vice rectors, each heading one of the three “disciplinary domains” such as Arts and Social Sciences, Medicine and Pharmacy, and Science and Technology, into which the nine faculties are divided. Each faculty has a faculty board and is headed by a dean. The position of dean is held part-time by a professor of the faculty. Through division of faculties and the addition of a previously independent school of Pharmacy as a new faculty, the traditional four-faculty organization of European universities has evolved into the present nine faculties. The disciplinary domain of Arts and Social Sciences includes the Faculty of Arts, the Faculty of Social Sciences, the Faculty of Languages, the Faculty of Theology, the Faculty of Law and the Faculty of Educational Sciences. The disciplinary domain of Medicine and Pharmacy includes the Faculty of Medicine and the Faculty of Pharmacy. The disciplinary domain of Science and Technology includes only the Faculty of Science and Technology. Uppsala University also hosts the “Forum for South Asia Studies”, a collaborative academic effort by its six faculties: Theology, Law, History and Philosophy, Social Sciences, Languages, and Educational Sciences. The Forum aims facilitate and promote research and education related to the South Asian countries: India, Pakistan, Sri Lanka, Nepal, Bangladesh, the Maldives and Afghanistan, on the national and international level, with Ferdinando Sardella, Faculty of Theology, serving as the Forum’s director. The university library holds about 5.25 million volumes of books and periodicals, 61,959 manuscripts, 7,133 music prints, and 345,734 maps and other graphic documents. The holdings of the collection of manuscripts and music include, among other things, the Gothic Bible manuscript Codex Argenteus. The present university library system comprises 19 branches, including the one in the Carolina building. 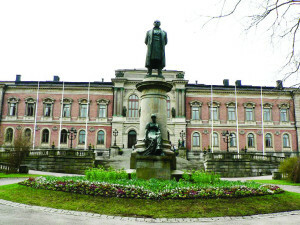 Up until June 2010 students at Uppsala University were obliged to become members of one of the nations, corporations of students traditionally according to province of origin. The system of dividing students into nations according to origin can ultimately be traced back to the nations at the medieval University of Paris and other early medieval universities, but the Uppsala nations appear only about 1630–1640, most likely under influence of the Landsmannschaften which existed at some of the German universities visited by Swedish students. In Sweden, nations exist only in Uppsala and Lund. The nations were originally seen as subversive organisations promoting less virtuous aspects of student life, but in 1663 the consistory made membership in a nation legal, each nation being placed under the inspectorship of a professor. The current thirteen nations all have a history stretching back to the early-to-mid 17th century, but some of them are the result of mergers of older, smaller nations that took place in the early 19th century to facilitate the financing of building projects. Uppsala University has signed student exchange agreements with about 500 universities across all parts of the world. It takes part in the Erasmus programme and the Nordplus programme. But there is a shortage of housing in Uppsala, a problem which has existed for many years. Both native Swedes and foreign students are finding it difficult to find accommodation when first enrolling into the university. This University is associated with 8 Nobel Prize laureates, and numerous royalty, academics and public figures.